SCOTTSDALE, Ariz.- Simply Dentistry in Scottsdale wants to change the perception of going to the dentist as a “necessary evil” by creating a more comfortable patient experience. Dr. Bich-Ngoc (Bicky) Tran provides the latest technology with personalized patient care aiming to educate and reduce any apprehension or misgivings. 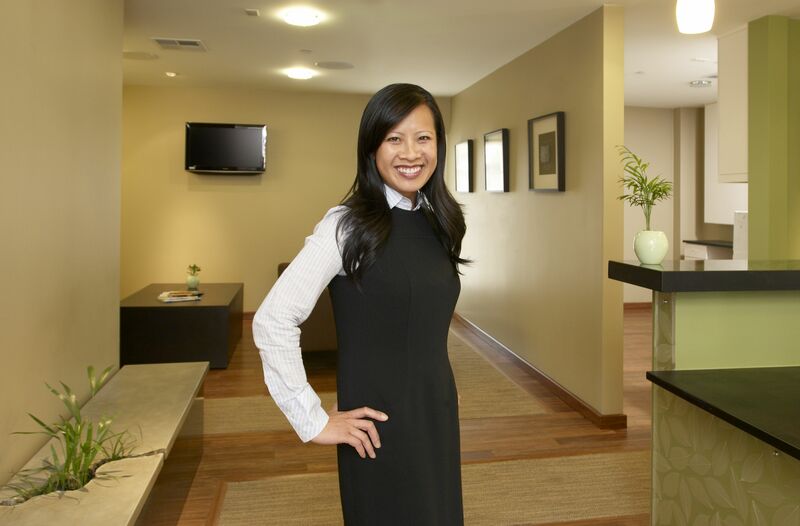 Dr. Tran has designed her practice to be a warm, welcoming, and eco-friendly environment. Her soothing office is housed in a remodeled 1950s home retrofitted with sustainable materials, from the insulation made from recycled blue jeans to the toothbrushes made from recycled yogurt cups. “Many dentists appear to be in the ‘business’ of dentistry,” shared Dr. Tran. “I’m in the ‘practice’ of dentistry.” Dr. Tran’s personal approach offers patients a new way to feel about dental health that is not remotely as uncomfortable as childhood memories of the dentist chair. In fact, she hopes for her waiting room to feel more like your family room than a dentist’s office. Dr. Tran understands that the technology of the dental industry is changing, and she has incorporated this new technology into her patient care. The electric handpieces used at Simply Dentistry are much quieter than traditional ones, and are almost drowned out by the sound from the television directly above the patient’s chair. The use of digital x-rays and intra-oral cameras allow the patient to see what the dentist sees. Laser dentistry results in significantly shorter recovery times for procedures ranging from simple fillings to cosmetic gum-recontouring surgeries, which improve “gummy” smiles. When used in removing smaller cavities, shots can often time be eliminated with the laser. A frenectomy surgery becomes painless with the use of the laser. Frenectomies can potentially eliminate lisps and speech problems when performed in early childhood. “While some dental procedures can still be uncomfortable, it is important for a patient to have a dentist that they can trust,” said Dr. Tran, who desires for an open relationship with each of her patients – one in which they feel comfortable to share all of their concerns. She takes these concerns into account when creating individualized treatment plans for her patients, offering alternative options that may be less costly whenever possible. Through the combination of Dr. Tran’s genuine attention to her patient’s needs, her use of cutting-edge dental technology, and her attention to environment-friendly practices, Simply Dentistry provides a personalized patient experience that is difficult to find elsewhere. To learn more about Simply Dentistry call (480) 429-9700 or visit the office at 7552 E. Camelback Road Scottsdale, Ariz. 85251. www.simplydentistry.com. For all media inquires contact Charlotte Risch at The Media Push at 602-418-8534. This entry was posted in blog and tagged dental health, dentist, eco-friendly, less pain at dentist, scottsdale, SIMPLY DENTISTRY. Bookmark the permalink. 2 Responses to "SIMPLY DENTRISTY AIMS FOR COMFORT OVER ANXIETY"